Fireworks Glasses — Rainbow Symphony, Inc.
Fireworks Glasses® and Rainbow Glasses®, The hottest item since the sparkler....specially treated holographic lenses break light into the spectrum. Fireworks Glasses® and Rainbow Glasses®, The hottest item since the sparkler....specially treated holographic lenses break light into the spectrum. Fireworks Glasses are an exciting addition to the fireworks displays, electronic dance parties, light shows and holidays celebration everywhere. View your world in bright new colors... The rainbow bursts will amaze you! Rainbow Glasses®are printed in a variety of full color graphics with educational information about light and color printed on the backside. 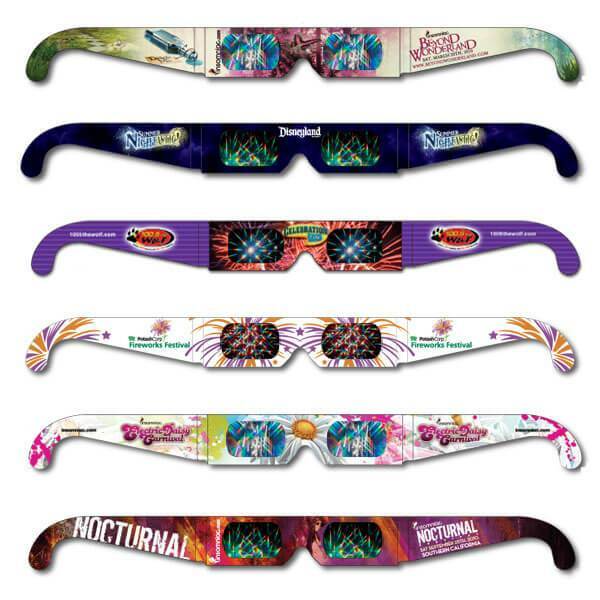 Almost any design you can think of can be printed over the entire face of our Fireworks Glasses®. Our art department can even create a special design just for you. Go mild or wild as your budget allows...from one to four-color printing, specialty lenses and custom die cut shapes. Holographic diffraction grating lenses that breaks light into the spectrum or rainbow starbursts. For viewing fireworks displays, laser light shows, holiday and city lights and for the study of light and color. Custom printed Neon Fireworks Glasses® with company names and logos are ideal for corporate promotions, co-op advertising and large events with multiple sponsors. Inexpensive enough to give away, Fireworks Glasses are the perfect promotional item and are printed on Neon Colors. Patriotic Red, White and Blue flag design. Ideal for 4th of July celebrations and events, with special areas set aside for your message or logo. It's simple to attach one or two Redeemable coupons to our Fireworks Glasses®. Use them to increase customer traffic and sales at any business. Great for attracting co-op advertisers and sponsors to your fundraising event. Coupons allow you to get maximum results from your special event or promotion! View your world in bright new colors! Holiday Rainbow Glasses® are an exciting addition to Festival of Lights Celebrations, Fireworks Shows, Holiday Light Exhibitions and Laser Light Shows everywhere. Specially treated holographic lenses turn every dot, dash and twinkle of light into a cascade of shimmering rainbow colors. The rainbow bursts will amaze you! Advertising - Custom printed Fireworks Glasses® with company names and logos are ideal for corporate promotions, co-op advertising and large events with multiple sponsors. 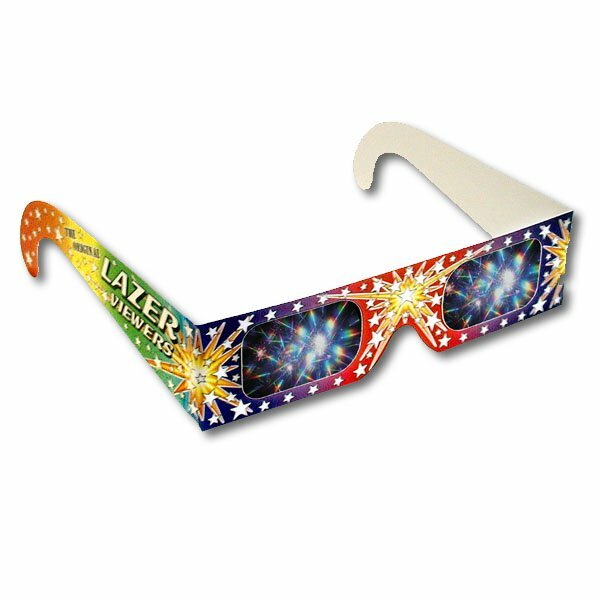 Inexpensive enough to give away, Fireworks Glasses® are the perfect promotional item. Fund Raising - Local charities, fraternal organizations, youth groups and service organizations have raised those necessary "organization supporting" dollars through the sales of our Fireworks Glasses. Special Events – Festivals, cities, event planners and organizers take advantage of the opportunity to pay for their fireworks exhibitions year after year through the sales of our Fireworks Glasses®. Better Quality and Prices…Direct from the Source – Order your Fireworks Glasses® factory direct from the only manufacturer of the "True Originals". Get the best quality, service and prices from the innovative company that has made Fireworks Glasses® the hottest item for fireworks exhibitions, retail fireworks stands, laser light shows and amusement parks.